There are many careers within colleges and universities besides being a professor. Individuals who work in the area called Student Affairs are often involved in creating and sustaining the many programs that occur on a college campus outside of the classroom. If working on a college campus appeals to you, you may want to look at NASPA, an organization of colleges, universities, agencies, and professional educators whose members are committed to providing services and education that enhance student growth and development. The association seeks to promote student personnel work as a profession which requires personal integrity, belief in the dignity and worth of individuals, respect for individual differences and diversity, a commitment to service, and dedication to the development of individuals and the college community through education. 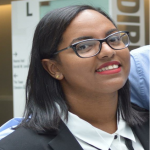 Alumna Yuleisy Audain (2016) works in Student Affairs at John Jay. I am the Peer Advocates Marketing & Communications Assistant for the Urban Male Initiative at John Jay College. Higher Education & Education involved in mentoring. My job consists of managing and making sure mentees in the Peer Advocates Mentoring Program receive the right tools to make their college experience the best that it can be while promoting and making sure all online content and marketing reaches the John Jay community. Pros: consist of interacting with students and seeing them become student leaders. Every day I use the skills that I learned as an English major while working with the students and administrators. While developing my critical skills I have been able to identify many of the methods of approaching other perspectives that come in through the door. I am able to be effective at multitasking and developing safe spaces for students and help them each step of the way until their graduation. I was part of the Urban Male Initiative as an undergrad and I wanted to give back to the community that helped me discover myself and how to develop myself as a college student and a young individual. To be patient and kind because it is an extremely demanding job to help someone become the best person that they could be. Be open to networking and developing your brand while ultimately improving yourself through these experiences. It has been my pleasure helping students become the best versions of themselves and it’s something that has impacted my life forever.